The boots fitted quite well although I found the heel cup to be a little big. 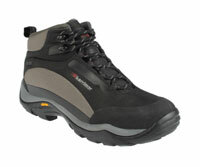 (I believe Karrimor do use a relatively high volume last.) The lacing system was ok but there isn't a locking eyelet so it was hard to get the optimum tightness in both toe area and around my ankles. These are low cut, relatively light and quite flexible boots which provided good traction on grass and mud. However, I did think the soles were not quite substantial enough nor was there enough toe protection when I was walking over rougher ground. On the plus side, my feet were warm and dry throughout the day. even when walking through some pretty wet grass. I haven't yet had opportunity to wear them in really heavy rain - encouragingly though there's really very little stitching on the uppers which is often the place where rain can get in. These are a good option for low level walking - for example Surrey, South Downs or perhaps lower level paths in the Lake District - particularly if you need a higher volume boot. However, you will need something more substantial if you are going up any big mountains.